I sent my box to Lindsay at Say No To Bacon. She lives in Oklahoma so it was my third time sending there. Maybe it’s a sign that I need to visit that great state. Debbie at Accidentally Delish sent my box all of the way from Arizona. Since I was going on vacation, I asked for food that would be great for traveling. She sent me some granola which is one of my favorite foods. I also got black bean chips. 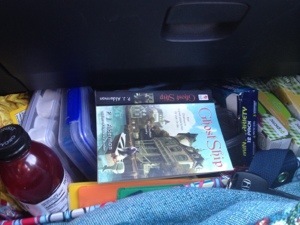 I did not bring those on the trip. I have to be in a mood for any type of chip item and then I eat them until I’m no longer craving chips. I know I’m random. I’m saving them for when I am really craving chips. She also sent me bars. Those are great not only for the trip down but also for when we are walking around town. I stick them in my back pack and away we go. I also got some fruit leathers which are great. The Wee One really loves them so I can give him one if he’s complaining about being hungry while we are walking around town. I will add pictures and links when I have actual wifi. I took the pictures and put them on my computer. However packing for 3 people for a week and a half trip was my priority. I’ve mentioned how much I like a local Farmer’s Market called Second Street Market. One of the vendors has a delicious granola called Triple Treat Granola. It contains walnuts, cranberries, and melted white chocolate. I sent a container to my May and one to my June foodie pen pals. Both of them loved the granola:). 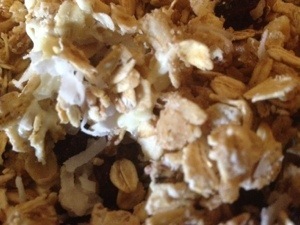 I’ve decided to recreate the granola and add another flavor element – coconut. It turned out delicious. In a big saucepan, combine water, olive oil, and brown sugar. Let simmer for 2 to 3 minutes. In a separate bowl, combine the oatmeal and cinnamon. Slowly add the oatmeal mixture to the saucepan. Stir each time you add some of the oatmeal. Make sure the water, olive oil, and brown sugar is evenly coated on the oatmeal. Take it off the heat. Place in preheated oven. Bake for 5 minutes. Add walnuts to the granola. Place back in oven. Take out of oven and sprinkle with a cup of the white chocolate chips. Put back in oven for a minutes. Take out of oven and stir the granola so the melted white chocolate gets all over the granola. Allow to cool and then add the remaining white chocolate chips, cranberries, and coconut. Enjoy over yogurt, froyo, or by itself. We eat dinner together most days. It is important to both Hubby and I. We were both brought up eating dinner as a family. So we want to continue this tradition with the boys. Our conversations can be so funny at times because you never know what the boys might say. Hubby told the boys he used to have a mustache because he wanted to look older. He shaved it off when he turned 30. IO: Did you get a senior discount at the movie theater? Me: Why are you so loud? WO: I was born in the year of the rooster. IO: When was I born? WO: In the year of the ram, that’s why you are so ramy. IO: These fries are so spicy. Me: Then quit eating them. IO: (Dips the fries in the ketchup.) These fries are so spicy. IO: Why can’t you tell eggs jokes? IO: They might crack up. IO: I go to the University of Monkey Face. I take classes about how to make glasses for seals and another class is arm pit smelling class. Kids 62 is the newspaper for the University of Monkey Face and Kids 68 is the normal newspaper. IO: This spinach tastes different. Me: I just opened the container. IO: Maybe I like aged spinach or something. WO taking the onions out out of his sauce. WO: I’m a ghost hunter. I think this is ghost slime. These are a few of the dinner conversations we have had at our house lately. I wouldn’t trade it for anything! Thursday – Happy Fourth of July!! !